Two companies and a manager have been fined a total of £440,000 after a Flintshire scrap yard worker died after suffering 90% burns in an explosion. 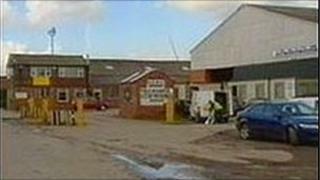 Mark Wright, 37, was killed while crushing aerosol canisters at Deeside Metals, Saltney in April, 2005. Manufacturer Jeyes, Deeside Metals and scrapyard manager Robert Roberts of Connah's Quay were all prosecuted by the Health and Saftey Executive (HSE). After the hearing in Caernarfon, the HSE said it was a "tragic case". The crown court was told Mr Wright, a father-of-two from Saltney, had been worried about safety at work in the months before his death in April 2005, had been conscious following the explosion. Prosecuting counsel Andrew Moran, said:"Tragically he understood what had happened to him and tragically he understood he was bound to die. He knew how badly burned he was and sadly he did succumb to those injuries." Jeyes, a manufacturer of household and cleaning products with premises at Mold from where the aerosol canisters had been taken to the scrap yard, was fined £330,000 with £50,000 costs. The company pleaded guilty to failing to ensure non-employees were not exposed to risk. Deeside Metal, where the prosecution claimed there had been multiple management failures, was fined £100,000 with £10,000 costs. The company admitted failing to ensure the safety of employees and not making a proper risk assessment. Mr Roberts, 57, alleged by the prosecution to have shown a "lax" attitude towards safety, was fined £10,000. He admitted failing to take reasonable care for the safety of other people. Defence counsel Andrew Long said: "Mr Roberts discharged his duties diligently as manager of Deeside Metal. He took his health and safety responsibility seriously." The lorry driver who delivered the canisters had reassured him that they had been degassed, he said. Judge Merfyn Hughes QC said there was a lack of a proper system to segregate hazardous waste at the Jeyes site. He said: "What strikes me is the aerosol canisters in this case are well known to be items which must be disposed of carefully. "Every housewife or other consumer knows used aerosols even when thought to be empty are capable of causing harm if not disposed of in an appropriate manner." Mr Wright's mother Dorothy, from Glasgow, said in a statement: "[Mark] told us and friends that he was sure someone would be killed one day as serious safety risks were being taken. He was looking for another job." After the case, she added: "A fine isn't a fitting penalty for taking a life nor is it a deterrent. Any other negligent employer in the waste industry would probably think that's not so bad." Also after the hearing, HSE Head of Operations in Wales, Jane Lassey said: "Both companies contributed to the death of Mr Wright by allowing this highly dangerous situation to arise. "This is a tragic case and must serve as a warning to other companies handling potentially dangerous material about the consequences of not having safe working practices in place."